To keep my LAN at home relatively secure, I decided to change the TCP port from 22 to something else in the SSH config file. Using the standard list of ports at Wikipedia listing I chose a port that is not a standard used port by the IANA. The router that I use at home is the Apple AirPort Extreme Base Station. I simply setup a NAT to point to my Linux Mint machine on that particular TCP port configured in the SSH config file. 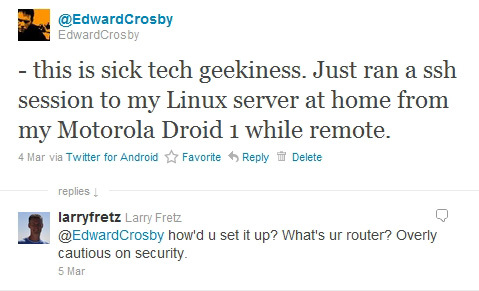 Once I got that configured I downloaded ConnectBot from the Android Market to my Motorola Droid 1 to use for the SSH connection to my Linux Mint machine remotely. It really is that simple. A few things to note: Make sure you have a really good password for the account you use on your Linux machine for the SSH connection and that you change it regularly. Also, for those interested, I would not recommend the Apple Airport Extreme Base Station for a router. It’s not that I’ve had issues with it (except for once when I completed a firmware update from Apple that had a bug in it and had to revert back to the previous firmware) or that it is not secure, I just think there are other wireless N routers out there that are less expensive and can be just as reliable and secure – I’m actually considering selling my AirPort Extreme and finding something newer. Also, I don’t know if this is standard on all home routers these days but every time I make a change on my Apple Airport router it requires a reboot, which is REALLY annoying as everyone at home loses connection for about 2 minutes. If you have any comments or additional tips on this please post below. If you have any questions you can email me directly from the Contact page of this blog or just post them in the comments also. Well, it’s been almost a year and a half and I have finally mustered the courage to root my phone and install a custom ROM. For those of you reading this and wonder what I am talking about, to root a device, like a phone, means to give yourself superuser privilege so that you can do things that the manufacturer never intended a normal user to do. Without going into too much detail on the subject I will refer you to the Wikipedia entry on Rooting the Android OS that will explain it much better than I. Bypassing my explanation will give me more time to explain to you the details I went through to root and install a custom Android ROM. Disclaimer: These are the steps I went through to root and ROM my Motorola Droid 1 and complete it successfully. If you try these steps and brick your phone, I cannot be held responsible for your actions or the outcome of your device. Be it known that if you try these steps you will void your warranty. First of all know that I am new to this and this was the first time I had ever rooted my phone and installed a custom ROM. I researched a lot of forums and websites to piece together all the steps necessary to get to where my phone is now. It is one of the reasons why I decided to write up these steps because in all my searching I couldn’t find one source that had step-by-step on how to root a Motorola Droid 1 and install a custom ROM. I had Android 2.2.1 Build FRG83D installed. From what I had found there is a way to root your phone manually and a way to do it automatically with rooting utilities some very talented developers had created on their own. Since I am new to the Android OS, I wanted to do it the easy way with a utility. There are quite a few out there and a couple of the most popular are z4root found here and SuperOneClick found here. I didn’t choose either one because after reading those forum pages I had seen a lot of people state that neither worked on the specific build on my phone. After reading other forums and sites I found out that a couple of people had success with Soup or Root found here for my specific build. After seeing the site and noticing the utility was still in beta and had not been updated since October of 2010 I was first a bit hesitant. However it was a very easy utility to use and it worked. The instructions given on the site are very straightforward and easy to follow. If you use that method you may have to do it more than once to be successful as I had experienced and also once you finish the process you will need to update the Superuser application from the Google Market that Soup or Root installs during the process. The Superuser application is used, after you root, to tell other applications that they can have root privileges to do what they need to do so don’t uninstall it. After I rooted my phone I installed some very useful applications that I highly recommend. One of them I used to install a custom ROM called ROM Manager. There others you can see listed here. Long before I had the guts to root my phone and consider installing a custom ROM I had heard of the very stable ROM called Sapphire by Crystal Clear ROMs for the Motorola Droid, and other devices. Having a stable and snappy device was one of the reasons I had looked into installing a custom ROM. Since updating to Android 2.2 I had noticed a performance decrease in my phone, most in UI refreshes when I close an application or change the orientation of the phone from portrait to landscape and vice versa. Hearing so many people rave about how fast Sapphire was I had to try it out. If you decide to install this ROM, even though you have tons to choose from out there, know that there are two files to download from their site; the straight, stripped down ROM (sapphire-2.0.2-update.zip) and the file that has the Google apps that normally come with Android devices come separately (sapphire-2.0.2-gapps-update.zip). But first things first: You need to backup your device before installing a custom ROM and the utility I used with ease, as mentioned above, was ROM Manager. Once you install it you should get the prompt to also enable ClockworkMod Recovery, which I highly recommend. You use this portion of ROM Manager to backup your current ROM in case of any major issues. To help me with this critical step and install a ROM I found these two articles to be very helpful from the Android Police site. I was able to follow those very informative steps to backup my device then use ROM Manager to install the Sapphire 2.0.2 ROM. Now, this is where it got tricky for me. See, I ran into a sort of Catch 22 after installing the Sapphire ROM; since it was just a very slimmed down version of Android without the Google Market, I had no way of installing applications, that’s where the sapphire-2.0.2-gapps-update.zip file came into play. But, again, I needed ROM Manager on my device to install the Google apps and no way of installing it, even though the file was copied to my SD card. This is the part where I needed to learn how to use the adb.exe tool in the Android SDK. Since I was on Windows I installed the SDK using the instructions and used adb.exe under the platform tools. One thing you should know that I had to figure out is that you need to install the Motorola drivers for Windows in order for adb to recognize the device when you plug it in via USB, so I extracted the drivers from the Soup or Root utility and installed it on my machine. However, if you had used the Soup or Root utility to root the device those drivers should already be installed. When I rooted my device I had completed it from my Windows MacBook (dual booted with Boot Camp) so I was a little confused at first as to why adb wasn’t seeing my device on my desktop. If you still need the drivers and not sure how to extract them from the Soup or Root utility you can download them from here. But, of course, if you still have the Soup or Root utility you can also just launch that utility and install the drivers from there. You can find all these commands plus more over at the adb page. Once I got ROM Manager installed I just selected sapphire-2.0.2-gapps-update.zip to be installed from the SDcard from within ROM Manager and was able to get all the Google apps installed onto the Sapphire ROM. Now, for those that may be reading this who are ROM installing pros I am sure I missed some steps that could have saved me some headaches or may have done something wrong that required the long way around but I am still learning and consider myself a newbie in this field. I’m just stating here my own experience on how to root your device and install a custom ROM. One thing that I have not done yet that I may do is purchase the premium version of ROM Manager as it gives you the option of downloading custom ROMs via the app to install instead of going out and searching for custom ROMs to copy over to my SD card. It’s make things simple. If you have any questions or comment on these steps just let me know. If you get stuck at a step or need any other assistance I will try my best to assist you. I don’t claim to be an expert but I will try to help you. Also, there are tons of resources out there on how to do this stuff. The only problem I found is that most of it is stuck in pages and pages of forum post over at XDA Developers and over at Droid Forums so there is usually a lot of digging to find what you need. That is one of the reasons why I created this post in hopes to help someone who hasn’t completed this to avoid having to go through all those post like I did. One last thing I will state is that I am impressed with the Sapphire ROM. It seems to be pretty fast so far and I would recommend to anyone. The only caveat with the ROMs from Crystal Clear is that they may have halted and no support continued due to the developer moving over to CryanogenMod. The details can be found here. Stelv: “I think you are going through too much trouble to do this, all you have to do is to boot into clockwork recovery. Wipe data and cache. Select install zip from sdcard. Then select rom zip file. Then tap power button to go back to main clockwork menu. Select install zip from sdcard again. Select Gapps file. Then reboot. Thats it. I just received my Motorola Droid 1 replacement (see previous post). Unfortunately, it wasn’t a Motorola Droid 2. For a little over a week I have had a hardware issue with my Motorola Droid 1, it started flickering, almost like a mini-strobe light. I could still use it as it wouldn’t blackout completely but at times the flickering would become so bad that I fear of seizure. The following video shows a brief example of the display flickering a little. At times it can be worse than what is seen in this video. Since I am still in my 1 year warranty, Verizon is sending me a replacement that I should see arriving on Tuesday. I have not had any other issues with this device and actually have fallen in love with it. However, I am hoping they send me a Droid 2 as a replacement since it has some keyboard and hardware improvements and is supposed to be faster. I doubt it will happen but I can still hope. Like the iPhone apps post from last year, I am going to post a list of applications I have installed on my Droid at the request of some friends. To make it easy, I installed AppBrain application management tool. You can actually see a list of my apps on their site here. And I also have embedded in the right sidebar their neat little widget. Below is my list of apps. I’m not going to go into each one of them as the post could be quite a few pages. So if you have any questions about an individual application, just contact me. A very important tip regarding apps in the Android Market: Read the comments. They can be very helpful when you are trying to decide if it is worth it or not.